Exam Results | What's Next? Northern Ireland’s colleges have been delivering technical vocational education and training for approximately 100 years. Within Northern Ireland we have 6 regional colleges and 1 agricultural college offering a varied and dynamic training offering. 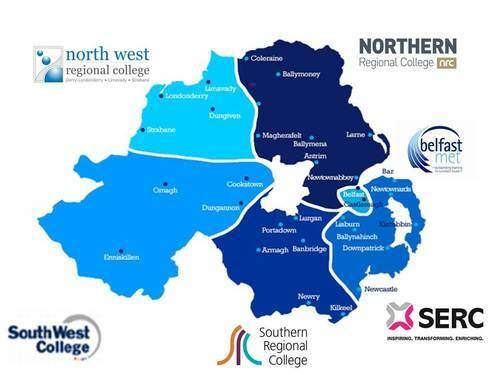 You can find links to each of the regional colleges below as well as a map outline the catchment area of each college. CSR Card - The Construction Skills Register (CSR) is a register of construction workers who have completed the industry approved CSR health and safety training course and assessment. You can find CSR training providers here. Forklift - A range of private organisations provide this training. Welding - You can find these courses at many of the Regional Colleges listed above. HGV - A range of private organisations provide this training. Level 2 in Food Safety - this is the mandatory certificate that all catering candidates should have.This certification takes an hour to complete. You can complete this certificate here. Food Worker Health & Safety - this isn't a mandatory certificate for catering staff, but is always good to have. This certification takes an hour to complete. You can complete this certificate here. Word/Text Processing - You can find these courses at many of the Regional Colleges listed above. Essential Skills: Maths, English & ICT - You can find these courses at many of the Regional Colleges listed above.